Su-27 - single-seat air superiority fighter. The plane has an integral aerodynamic layout, which permitted it to attain high values of lift/drag ratio and lift coefficient along with assuring a considerable increase in the internal fuel reserve and, hence, to do away with the drop fuel tanks. Two AL-31F afterburning bypass turbojet engines, each having a maximum thrust of 12,500 kgf, provide the plane with an excellent thrust-to-weight ratio and agility. The engine air intakes are fitted with mesh guards, preventing the ingress of foreign matter into the engines during landing and take-off. The K-36DM ejector seat allows the crew to escape in emergency irrespective of the aircraft flight altitude and speed, including when it runs on the airfield. active fire control system using special bottles to quench fire in engine nacelles. 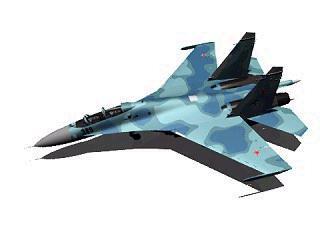 All the above enables one to conclude that today there is no other aircraft on the world market which could outperform the Su-27 in destroying air targets and gaining air superiority. simpler avionics, which has visible appearance as a missing IR(1) sight. There also is a two-seat attacker version, the SU-27IB, with side-by-side seating in a reshaped nose. A stripped version of the Su-27, without armament or electronics, used to set time-to-height records. The mainwheel brakes could not hold the aircraft at full thrust so the P-42 was anchored to a tracked armoured vehicle by a steel hawser with an electronic lock. With the engines wound up to full power, the hawser was released and the P-42 leaped into the air and climbed at an optimum angle to altitude. This flying display sequence appeared in one of the Sukhoi's flyers which I was kindly provided by their staff at booth 2E15. 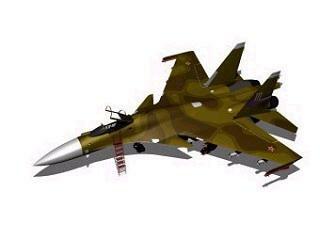 This scheme does not fully show the exact routine flown by Su-37 at Paris'97, but closely matches first half. 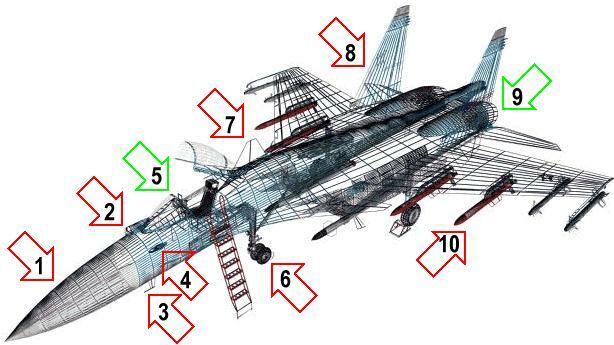 The super Flanker flew slightly extended sequence in which few elements were shuffled. 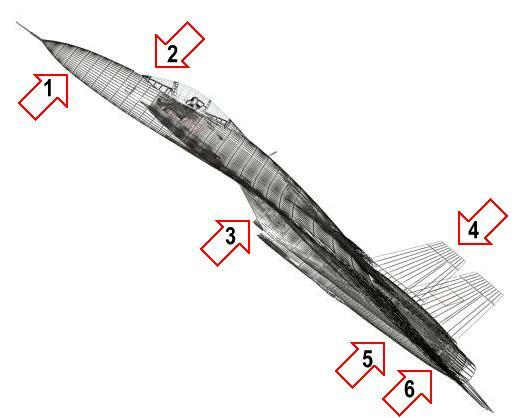 For example the tail slide (16) was replaced with very tight loop and Hook (horizontal Cobra ) was added. Both Saturday and Sunday performances (June 21st and 22nd) are available in MPEG format. Clicking on the individual element listed in the right column will download this particular part of the Su-37 display. Note that some elements are grouped so that a single clip contain several elements. Flown by Evgueni Frolov (Sukhoi's spelling), Su-37 put on most marvelous display I have ever seen and was the only one to trigger applause. Not even Rafale was greeted so enthusiastically by (mostly French) public. On Sunday, June 22nd, full display routine was not flown because pilot was not able to retract aircraft landing gear. However Frolov carried out very impressive climb (1), vertical roll (2), 3/4 loop (3) followed by Cobra (4) with landing gear extended!!! Only after this he cancelled the rest of the display to a great disappointment of the spectators. This unfortunate mishap will certainly cause a slight damage to hard to beat Su-37 image. Within hours French TV made a comment on Sukhoi team unable "do things right" and pointed out "obvious" superiority of Rafale. What they failed to notice, however, is that none of other fighters managed to came close to Su-37 display with gear down or up. 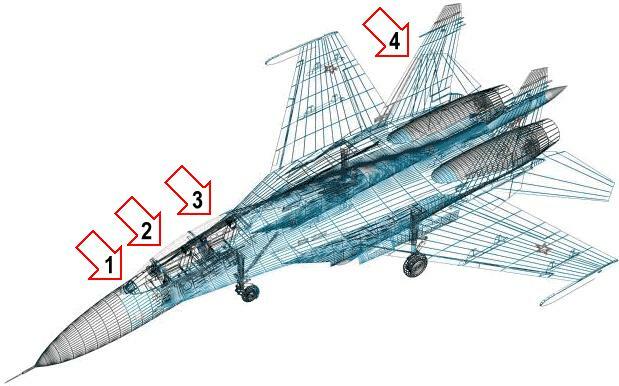 Curiously, the video shown at Sukhoi booth clearly depicted Su-37 doing double Somersault (aka Kulbit). 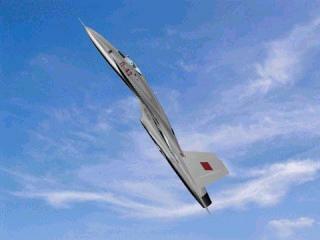 This maneuver was performed at higher altitude than "plain" airshow version. 5. Heading reversal 90ox270o with descend. 7. "Pougatchev Cobra" with turn. 8. Flight at 450 pitch with 90o turn. 13. Somersault (Loop with min radius). 18. Heading reversal 90ox270o and landing. Last modified on: Monday, April 10, 2000.